Bitmap fonts offer the possibility to display pre-built, multi-colored characters. Using this method allows an exact fine-tuning of the design. However, the disadvantage is that all characters have to be provided as graphic resources. In order to convert pre-build characters into a format suitable for textures, a graphic strip of all characters and a description of their allocation have to be created. Both of the PNG files contain the characters in different sizes. The text file includes the character allocation of the graphics in UTF-8 encoding. The following script files (Unix/Windows) contain the calls which direct the font converter to create the corresponding textures and metadata. These files can directly be used in the graph node. There are several other parameters, which remain unmentioned in this example. Attention should be paid to the fact that there is enough space between all characters in the strip in order to get recognized as individual characters. The minimum separator between two characters is one column of pixels with an alpha value of 0. In order to connect "separated" characters, an "invisible" connection with an alpha value of >=1 needs to be drawn. 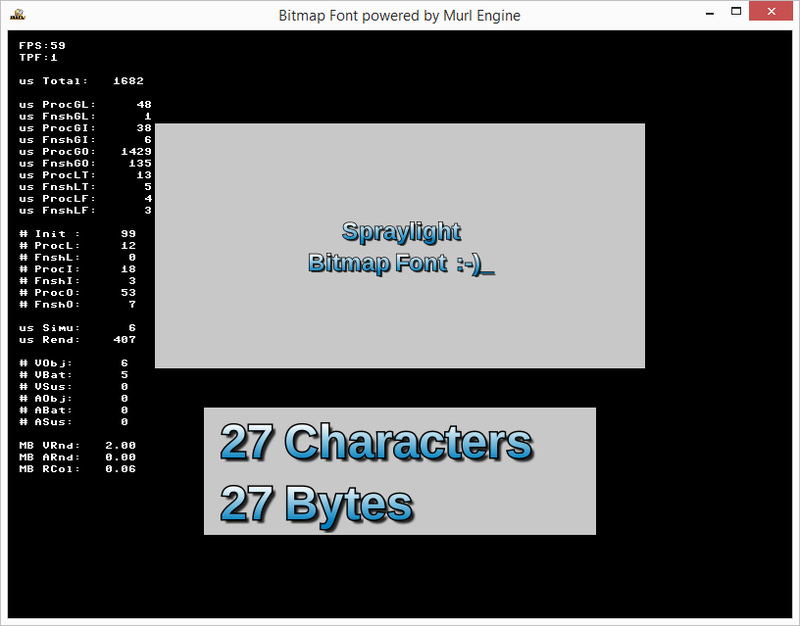 As a first step, bitmap font resources have to be added to the package. The instances for texture, material and main sub-graph are instantiated with the node <Instance> directly in the package.xml file. In order to use bitmap font textures more than once, nodes are recommended for referencing. The TextGeometry node requires the corresponding texture with its characters to be active. This can be achieved with <Reference targetId="/textures/arial_color_24"/>. The resource containing the character definitions of the texture is specified with the attribute fontResourceId="package_main:arial_color_24_glyphs". A virtual container for text alignment can be defined with the attributes containerSizeX="500" and containerSizeY="250". The bitmap font application provides a simple function to edit a text and to display information. The second block implements a simple edit function. Only the input of new characters at the end of the text and the deletion of the last character will work. Checking with if (mEditTextNode->IsCharacterPrintable(utf8key)) is important in order to determine, if it is possible to display the required character. If it is not possible, the character will not beattached. Furthermore, isPrintable is set to false to show the reason, why the character is ignored. This auxiliary function shows the edited text with an attached underscore or with the comment "non printable", if a character cannot be displayed.